Information and prices shown on this web site are for reference purposes only, please see Home page for details. This device was designed to provide the most number of options possible in remedy making in a small hand holdable device. Like the Voice Programmed Remedy Maker shown above this device also makes vibrational remedies from names of substances and descriptions spoken into it, but it also links to your computer and to the software we provide so you can input remedy information from your P.C or Laptop. Vibrations are outputted to the stainless steel well on the front of the instrument, or to the vial built into the side of the instrument, or to an output jack which can be connected to an external plate for potentizing large amounts of carrier material all in one go. Small enough to carry on your travels, ideal for both home use and in the professional practice, this device is sure to fill your needs whatever the circumstances. This device is the only full function Radionic Potentiser / Homeopathic Remedy Maker in the world which is small enough to fit in the pocket and so can be carried and used anywhere! 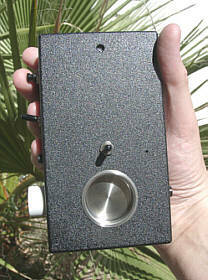 This little device can make literally thousands of different vibrational remedies from names of substances or descriptions spoken into it, which may include Homeopathic Remedies, Flower and Gem Remedies, even descriptions of illness symptoms, each device making the equivalent of at least $40,000 worth of Remedies, and this includes medications which would be impossible to obtain anywhere else. This device has been manufactured by us since year 2000, and a very considerable number have been sold. 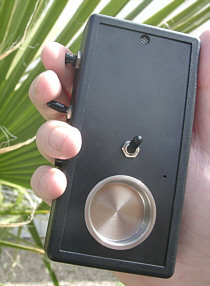 Employing a complex subtle energy circuit designed by us, the device makes ANY kind of vibrational remedy or remedy combination from words or descriptions spoken into it, and these vibrations can be put into tablets, or bottles of water or alcohol or transmitted directly to patients for distant healing. For even more features including the ability to input information from your computer using our special software, please see our Combo Remedy Maker - shown above. Ever wished you could do Reiki while sleeping?